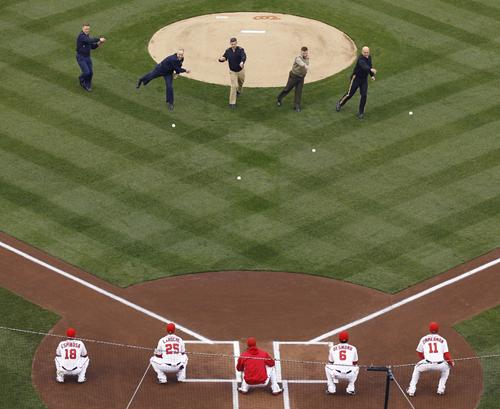 President Obama has a lot on his plate now, so you can understand why he might not be so eager to take a couple hours out of his day and deal with the circus known as the Washington Nationals. Anyway, instead of the commander in chief, the Nationals went a few rungs down the depth chart, turning to five flag officers to throw out opening pitches on Thursday, when they opened the season against the Atlanta Braves. • Army Maj. Gen. Karl Horst. • Navy Vice Adm. Michael Vitale. • Marine Corps Lt. Gen. Terry G. Robling. • Air Force Lt. Gen. Richard Y. Newton III. • Coast Guard Rear Adm. Paul Zukunft. It was a nice add-on to the traditional military fly-over, provided this year by the Joint Base Andrews-Naval Air Facility Washington-based 113th Wing.